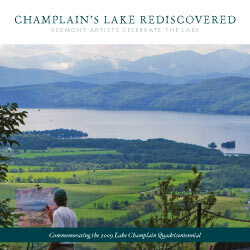 A 92 page full color book of paintings, photographs, and art in other media by 38 Vermont artists inspired by Lake Champlain, Vermont's "Great Lake." Short biographical sketches provide context for each artist's work. The juried exhibition for which the book served as catalog, was a featured part of the 2009 celebration of Samuel de Champlain's arrival at the lake in 1609. Venues included Shelburne Farms, National Arts Club in NYC, Boston Public Library, Southern Vermont Art Center, and Vermont State House. Introduction by Curator Douglas Lazarus; Foreword by Bill McKibben. Bonnie Acker; Sheel Gardner Anand; Eloise Beil; Kathleen Berry Bergeron; Dale Sherman Blodget; Joseph Bolger; David Brewster; Brenda Lea Brown; Judith C. Carbine; Jeffrey Clarke; Ann Coleman; Harry Dayton; Peter Dreissigacker; Kevin Fahey; Georgina Forbes; Janet Fredericks; Gary Hall; Karin Hardy; Kirsten Hoving; Charles Hunter; Rory Jackson; Kathleen Kolb; Douglas Lazarus; Meryl Lebowitz; Katharine Montstream; Elizabeth Nelson; Susanne Peck; Tom Pollak; Gerard Rancourt (Tsonakwa); Marilyn Ruseckas; Kenneth Rush; Cameron Schmitz; Helen Shulman; Wendy Soliday; Nancy Stone; Brian Sweetland; Claire Van Vliet; Karla Van Vliet. Site content © 1997-2006 Images from the Past, unless otherwise noted.